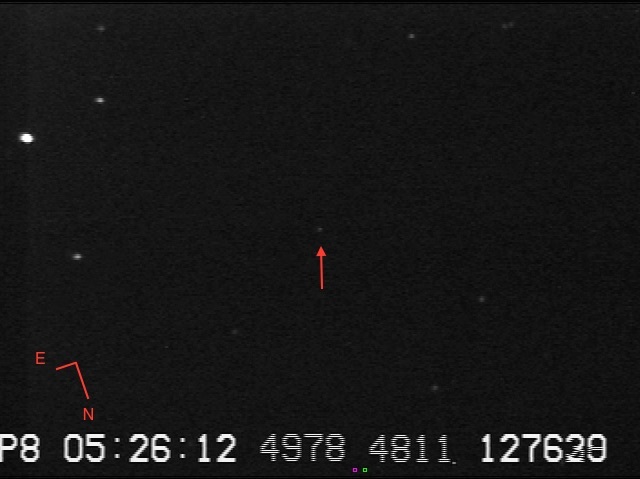 You should check that your IOTA-VTI is set to FULL SCREEN. This is the mode that we will use for the remainder of the RECON Project. Print this page as well as the RECON Event Detail Page for 99HR11 and practice finding field prior to event. Note the revisions/addition to recording procedures outlined below. If there are technical or scheduling issues, please contact the RECON leadership team by emailing tnorecon-org@mailman.boulder.swri.edu. Event Video – Record a continuous video file during the event window listed for your location on the table found on the RECON Event Detail Page. Dark Field Video – After recording the event, there should be time to make a 2-minute dark field video before the next event. 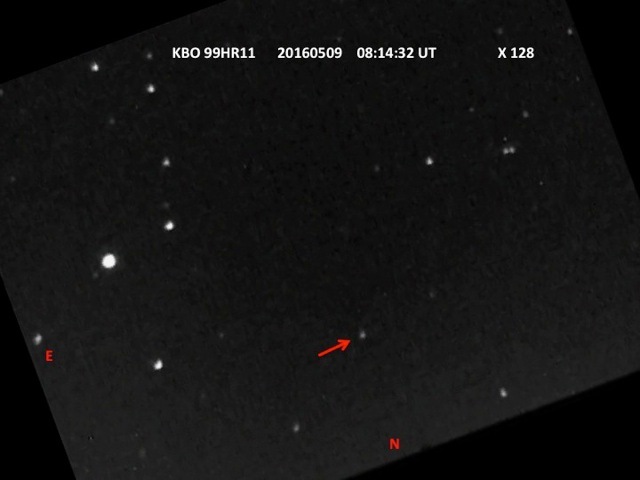 Do NOT turn off the telescope; you need the scope to continue tracking for the next event. We recommend that you first move the telescope to acquire the star field for 02GZ32. If you run out of time in the ~40 minutes before this second event, you can hold off and record the dark field after the second event is completed. If you run out of time in the ~40 minutes before this second event, you can hold off and record the dark field after the second event is completed. If there is plenty of time remaining after you have acquired the new field, you can loosely cover the front end of the telescope (or the front end of the dew shield) with the telescope lens cover and record a 2 minute video with no light entering the scope. This video will be used to create a dark-field image for use during data processing. For this video, you should use the same sense-up that you just used for 09HR11 (e.g., 64x). After you have completed the dark field video, take the lens cover off the scope, confirm that you are still pointing at 02GZ32, and prepare to record this event at the proper sense-up. You will also want to take a sky field video at a sense-up of 64x, but this requires turning off the telescope which will lead to a loss of alignment for the scope. Because we have two events this night, you should save the sky field video for after acquiring data for 02GZ32. We have included instructions for this on that event page. Each of the videos should be saved as a separate file in the directory labelled C:/Users/RECON/Data/20160509/. (Note that this directory is the UTC date of the observation.) You should set VirtualDub to save video directly to this folder with the first file being named 20160509_01. VirtualDub will then index each of the subsequent videos as 20160509_02, 20160509_03, etc. For this night, you will be recording additional files when you move on to the next event; these will be labelled with next index number (e.g. 20160509_04, 20160509_05, etc). To keep track of which filename corresponds to which video, it is very important to document your observations and include this along with your video data – see Reporting Observations to download an Observation Logsheet and txt file template. The finder charts provided below show the field of view and orientation at the time of the event for the RECON setup. 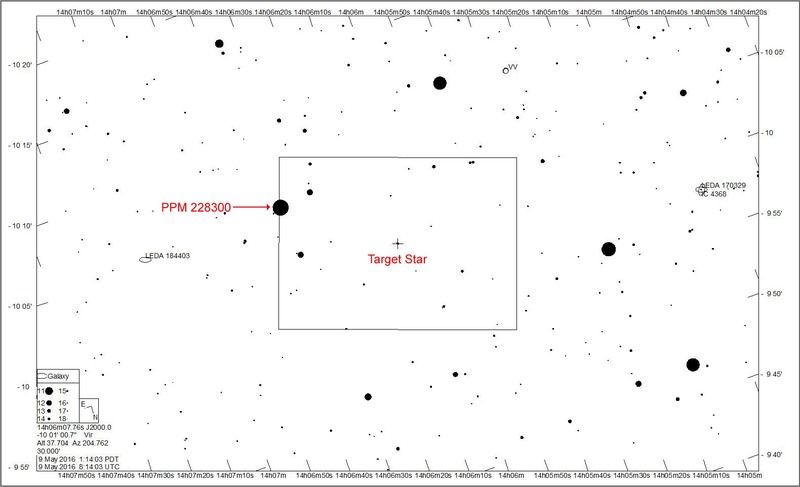 The target star is labeled on the 30 arcminute finder chart. 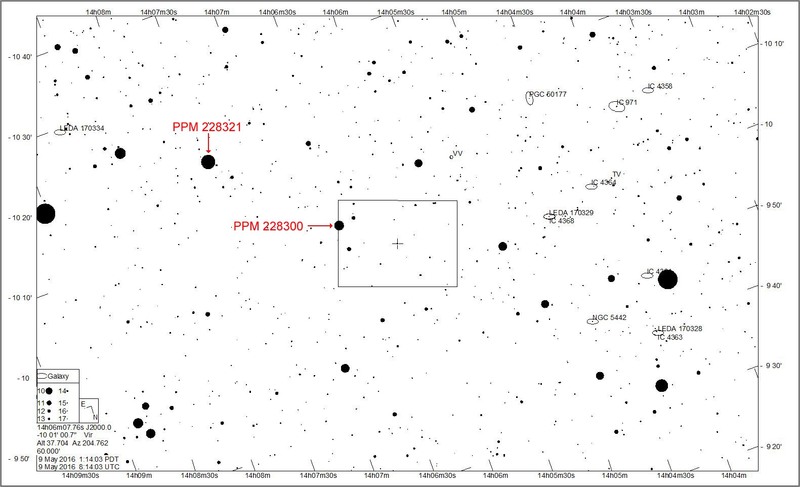 Various stars found on the “star train set” for this event are shown on both charts with the prefix PPM (which stands for Positions and Proper Motions Star Catalogue). Star field provided by Bill Gimple. Image has been rotated to approximately match orientation expected at time of event. Regardless of whether your team was able to collect data, we need you to Report Your Observations. This includes completing an Post-Event Report, saving an electronic version of your log sheet, and uploading both videos and observation log to SwRI in Boulder.